Salam Ramadan to all my Muslim friends, readers and followers. Selamat Menyambut Bulan Ramadan, Muslims across the world fast during daylight hours in the holy month of Ramadan. In hot climate countries such as Malaysia, the heat and humidity could take a toll on the body. Fatigue and dehydration can set in easily. 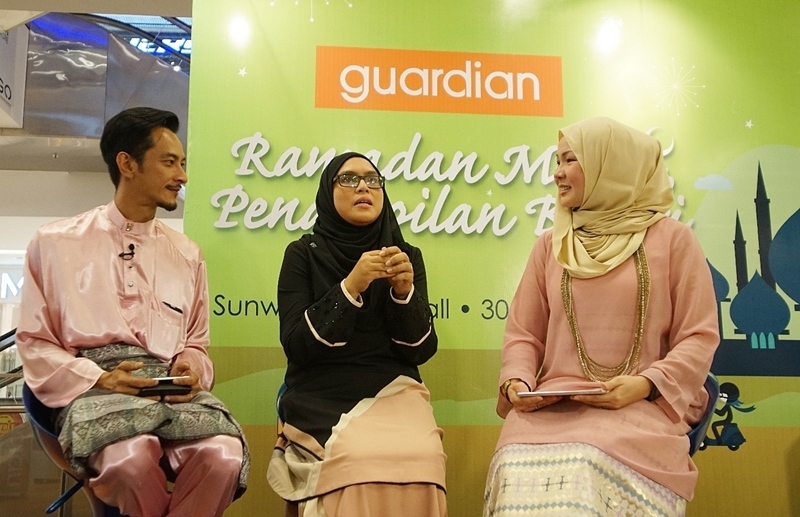 Recently Guardian Malaysia joined forces with popular celebrity guests to share insights and tips on staying fit and healthy throughout Ramadhan and the Raya festival that follows. The theme of the panel discussion “Ramadan Murni, Penampilan Berseri” aims at raising awareness on how to maintain a balanced and healthy lifestyle during month-long fast. The sharing session was hosted by Nazrudin Rahman and his wife, Sheahnee Iman Lee or better known as Naz and Sheahnee, the panel included Guardian Malaysia’s own pharmacist and store manager, Puan Hajjah Umil Kalthom and Assistant Manager for Public and Government Relations, Puan Farahani Failul Rahman. Lending additional glamour to the event was well-known actress, TV presenter and entrepreneur all rolled into one Ms. Sazzy Falak, and popular sports celebrity Mr. Mohd Khairul Effendy @ Ayon, a leading name in the game of futsal. “Therefore, eating right is important during the fasting month. And this can be easily achieved with proper planning and care,” she added. In conjunction with Ramadan, Guardian has lined up a comprehensive and wholesome range of festive promotions available at all Guardian stores nationwide. These include selected vitamins, supplements, beauty products, pain relievers, deodorant, perfume, personal care products as well as skin and hair care products. Selected promotions are also available on Guardian’s online store.